If you are like me, you probably have people in your life that ‘have everything’ and tell you not to buy them anything during the holidays. My grandparents live in retirement homes and have very little space for anything I gift to them, so I am always on the look out for ideas that are meaningful but practical. I often send them food gifts (cookies, fruit baskets, candy) since those are appreciated and don’t take up space, but they seem a little impersonal. This year I was contacted by Katy’s Goodness and they told me about their Thank A Deserving Military Veteran campaign. I knew I had found the perfect gift. 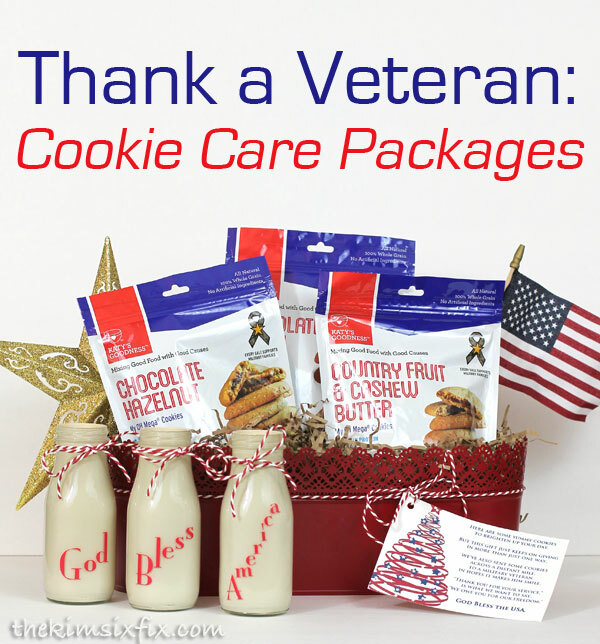 For $30 you can have a Cookie Care Package shipped directly to a military veteran on your behalf. You just buy the cookies, and #KatysGoodness does the rest. I love this idea, since both my father-in-law and grandfather are military veterans and therefore it has personal meaning to my family. Every purchase (online or retail) will go towards a $3 million donation to support Katy’s Goodness’ nationally recognized charity partners: Easter Seals, Student Veterans of America, Warriors in the Workplace, and Support Military Foundation. Lastly, I item on the note, and the gift was finished. If you are interested in shipping cookies to a Veteran as a shift you can learn more about the Thank A Deserving Military Veteran campaign here. Disclosure: I received cookies and compensation for my time to write this post, but all opinions are my own.